The Orange County Board of Commissioner’s narrowed the possible trash transfer sites to three – 779, 759 and 056 – this evening during their special working session [agenda]. All three are along Hwy 54. While I’m quite happy that the Rogers Road community is off the hook, at least for now, I’m troubled by the process used in narrowing the field. As I said to the BOCC several months ago, the process must be more than seem to be fair, it must be measurably fair. This reiterated my March 2007 call (Trash Talk: Systematic is the New Watchword) to junk Orange County’s Solid Waste Advisory Board’s subjective analysis and replace it with the more objective decision-matrix process. Beyond objective metrics, I added that the criteria used must be understandable and equitably applied in order to build confidence within our community that the end-result – placing an unwelcome solid waste transfer facility in someones backyard – was fair. I was quite pleased that the BOCC did adopt a matrix approach and had their consultant, Olver [Orange County site], rank sites based on three broad sets of criteria: exclusionary – which removed sites, technical – which ranked sites by their suitability and community – which introduced community values, like environmental justice, into the process. The rub is in applying the criteria correctly, objectively and equitably. As once again demonstrated this evening, the BOCC and their consultant still are having difficulties with application. I’m fairly sure that a number of citizens attending this evening – including those who dodged the bullet – were concerned that necessary criterion – cost, transportation, environmental, infrastructure – were either missing or not applied correctly. For instance, in re-checking my Mar. 9th, 2007 analysis of the county’s projected “centroid of waste production” (2035 Orange County’s Garbage Center of Gravity?) 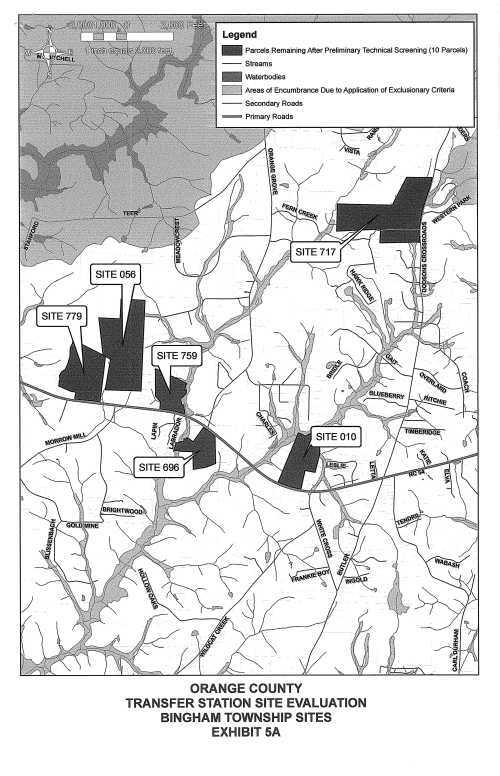 – incorporating additional data from Mebane, Durham County and extrapolating growth at the newly approved developments like Buckhorn – I’m remain convinced that Olver’s calculations are off. This is critical as sites are excluded if they lie 12 miles or more beyond the center of waste production. I informally suggested the County have UNC’s relevant academic departments do a quick review – there’s still time. I attended the meeting this evening to reiterate my concern that the public outreach portion of the process is “designed for failure”. As I cautioned the BOCC before, this cannot become a matter of “Us and Them” – neighbor against neighbor. So far, building bridges between folks has been left to the community – with the Rogers Road coalition leading the way. In spite of professing their desire for community input, there has been a failure to incorporate citizen contributions from previous meetings. Worse Barry Jacobs confusing behavior this evening – “running out the clock” to limit community comments – left more than a few citizens new to this issue dismayed (I spoke to several after the meeting – they all thought Barry did it deliberately). Considering the problems in applying the technical and exclusionary principles, Olver’s confusing “draft” community input document, the severe self-imposed time-line and other similar issues, I’m worried that the BOCC will arrive at a decision that doesn’t account for community concerns. [UPDATE] Herald-Sun story (sorry, they still don’t get it – registration required).